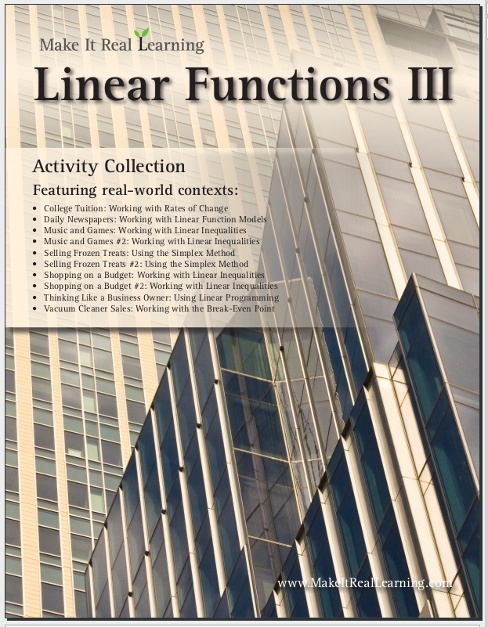 The Make It Real Learning Linear Functions 3 workbook focuses on real-world situations that may be effectively analyzed using arithmetic concepts such as rate of change, linear function, inequality, system of inequalities, and linear programming. This book suits best high school algebra. From using linear inequalities in shopping clothes to analyzing the break-even point of a vacuum cleaner salesman, learners get to use basic algebra skills in meaningful ways. 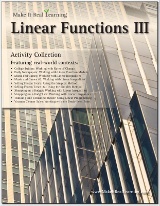 Each activity integrates real world information, companies, and issues (e.g. Justice clothing, Apple iTunes, thinking like a business owner), not just "realistic" data.